I stared to throw sidearm after my sophomore year of college, at Illinois State University. The reason I decided to change my are angle is because I was trying everything and anything to improve. After red shirting and having a 9+ ERA, I knew I needed to make some changes. I mixed up throwing "traditionally" and and sidearm because I still wanted to throw my curveball. Luckily, I was able to pick it up pretty quickly and by the end of my sophomore year I was the closer and had and ERA in the low 1's. some advantages of throwing sidearm was that I become very tough on lefties. Throwing from the side and on the far left side of the rubber I was able to set an angle that started behind lefties. Also, it gave both lefties and righties a different plane of of sight and the pitch that they are not used to. Finally, I was able to develop the pitch that revived my career, a sidearm slider (frisbee). if I hadn't dropped down I 100% believe I would have never reached the success that I was able to accomplish. I know I wouldn't have gotten drafted or even be very competitive at the college level. Dropping down when I did was a perfect storm. The combo of my struggles beforehand, good coaching and luck helped me develop to become a good pitcher. I'm not too sure if dropping down earlier would have been for me and definitely not later in my career. The elements that played at that time in my career worked best for the change. That being said, it saved my career and allowed me to progress my career to places that I never though I could reach before. If you are a pitcher and considering dropping down you need to consider a few things. First off, make sure it's right for you. 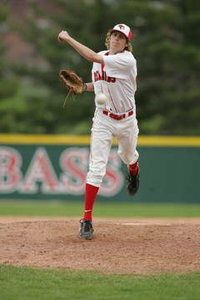 Sidearm is not for every pitcher it comes naturally easier for some more than others. Make sure it feels comfortable overtime. Luckily for me it was an instant transition and felt natural. Second, it would greatly benefit you to find somebody who throw in that similar slot to help guide you through the transition. Finally, remember that at its core the basic pitching mechanics need to be close to the same. Find a balance point, use lower half, follow through and finish strong, etc. Personally going through the transition and teaching a few sidearmers I've notice the biggest mechanical too I have to say is to stay through the pitch. As a pitcher comes through the pitch you need to keep you chest down through the pitch. Once the chest and body pops up the pitch will either be flat or sail on you. I also found, for me specifically, to open up my stride. This helped me pulls my slider across my body aggressively with the open landing. This worked for me specifically but other may find it better to stay closed or straight on. I basically threw 3 pitches total Fastball, Curve, and Slider. Form the top I threw a FB at about 84-87 and a 12-6 Curve at 72-74. From the side, I threw a 2 Seam FB at 82-85 with more movement. Finally I had my frisbee that I would literally throw 90% of the time. The slider or frisbee would be at 68-69. The slider was SLOW and enticing to hitter that slid across the zone. In college I was a closer and faced both lefties and righties but while playing in the minors I was a lefty specialist and faced predominantly lefties. I was an non-overpowering strikeout pitcher. To righties I would usually start with a get-me-over slider or occasionally a FB. Once I was ahead in the count if come with the over the top curve or bust them in with a fastball. For lefties, they got a steady diet of sliders that I'd would work further and further off the plate. I'd occasionally come with a FB or curve to keep the hitters honest.